Headwax - there is a thread in the Commons forum in which people discuss the inspiration for their forum avatars and screen names. Some people have very poignant stories. Not me. I just thought the Illiad was an interesting story, and I always wondered why Diomedes did not get more popular attention. I'm sure he would be more famous if he rode a cyclopstritch. Vyusur - thanks for the kind words. In practice, Bryce is a better landscape tool. However, I am generally happy with Carrara. Here is a landscape that I did for a prior challenge. I was pleased with the ability to blend the more dense hillside texture with a less dense side of the trail. It looks more like a path and less like a sharp road to my eye. Yeah, the blending feature in those landscape shaders is really nice! Great render, Diomedes! I've missed many of these challenges. One day I'd like to start a cycle where I go through the first challenge, all the way through, then the next, then the next. Just take a bit of time each day to get a little further. Bummer that there's just so much other stuff to do! Diomede, I've sent you a PM. I am going to show the steps I use to create a Genesis 2 Male character in Carrara for use in Carrara, but using Studio's morphloader. This first half will be the shape. The second half will be a material set based on a ForbiddenWhisper merchant resource. Finally think I understand this workflow after watching a SickleYield (SY) tutorial. Although SY used Blender, the same concepts can be adapted for Carrara. Here is the basic workflow. - Use the vertex modeling tools to change the shape as desired. Here is the SickleYield tutorial from which the above was based. My big hurdles with creating morphs for Studio/Carrara for genesis and genesis 2 figures were scale and proportion changes. It turns out that these are not such big problems. Studio's joint editor can try to match the changes with one click. In the following, I will try to show some screenshots adding detail to the general steps outlined above. I will create a basic body morph for G2M to make the limbs longer in relation to the torso. Think body for Olympic runner instead of swimmer. As per above, I started a new empty Carrara scene. I loaded G2M default figure from the browser. For the forum TOS and naked Daz figuees, I changed the Assemble room display to wire mesh. Yuck. I entered the vertex modeler. It gave me a topology warning. I ignored it. I took some preparatory steps. I want to pause and point out two tools that I don't see get used very much. The top tool menu has many grayed out icons. However, the magnet and the displacement brush are both still active. The displacement brush can be very useful, but the strength setting must be reduced to a very low number. To start, I simply wanted to lengthen the long portion of the shin and the long protion of the thigh relative to the rest of the figure. To do this, I selected the entire figure down to the mid shin and turned on the soft select (set to 3 or above). I then translaed the selection a desired amount in the z axis. I repeated for the thigh. Together, these two changes lengthen the legs in relation to the torso, and lengthen the straightportion of the shin in relation to the calf. Repeating this process to extend the forearm and bicep was a little more subtle because the meshes of the arms do not extend directly in the x axis. Concept is the same, though. Same process but to a muchsmaller degree was applied at the waist and the neck. Use small amount here to avoid negating the proportion change. A return to the Assemble room will show that the figure is now taller. For the next step, I used the displacement brush to make the figure more muscular. When clicking the displacement brush, the figure turns a solid white. I find it better to educe the strength of the brush. In this case I set it to 1. Note that the brush itself can be changed. I used the default brush. For the next step I used the displaement brush to enhance the major muscle groups. When finished, I changed the brush setting to "smooth." I brushed over the areas that I had displaced to smooth the results. I then returned to normal vertex editing mode by choosing another tool. You can confirm that the number of vertexes has not changed so the morph should be fine. That is enouh change for this demonstration. The next steps will be to export to Studio. Preserving scale from one program to another is usually a hassle. The key here will be to export as an obj with the setting of Daz Studio Morph and then importing in Studio with scale set to Carrara. To do so, return to the Assemble room, and use File : Export and choose the wavefront obj format. When the menu appears, set the target to Daz Studio Morph Target. Make sure "export object with morph and skinning" is checked. The next steps are in Daz Studio. Open a new scene and load default G2M. To start morph loader pro, go to the top menu bar and select EDIT : FIGURE and morph loader should be an option. Its menu will appear. At the top of the morph loader menu, it says convert to and from. If you used the scale suggested above, then set the "from" to Carrara. Then navigate to your saved obj file using the "choose morph files" menu.. Your morph will load with the name of your file. You can change the name and some other features in this menu. Click the triangle next to your morph name to expand the menu. I clicked the file name to change the name of my morph to BrashBodyTry1. 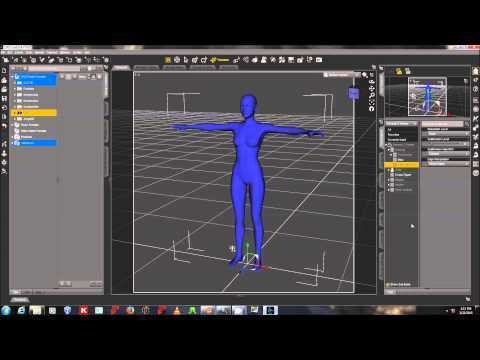 In SY's tutorial, she changes the morph's location (figure level or actor level) here but I missed how it was done. There is a problem. By changing the limb proportions, the skeleton no longer matches the mesh. To confirm this, check the joint editor. Start the joint editor, look under the tools tab in the top menu. Notice that the arms of the mesh are higher than the skeleton. The joint editor can be used to fix the skeleton. Right click in an empty area of the scene. A menu will come up for the joint editor. Use EDIT : ADJUST RIGGING TO SHAPE. A menu with a list of bones will appear. Check the bones that you want to adjust. In this case, I want to adjust all of the bones because of the scale changes. The skeleton will shift to match the morphed mesh. See how the arms of the skeleton moved vertically. Second, right click again and choose ERC freeze and new box coms up with accept. That is it. The morph should now work. I did some tests. First, I started a new Studio scene. I loaded default G2M. I found my morph in the morph loader pro area. I loaded a G2M clothing set and used fit to. Worked fine. I then did a test for Carrara. Using the figure and clothing in my Studio test, I used File : Save As : Scene Subset to save the morphed figure and clothes as a duf file. I opened Carara and loaded the duf file. Lods fine. I then did a side by side comparison of default G2M in the same clothes as my morphed G2M. Hope you find this method useful. Suggestions welcome. Thanks for setting this out so clearly, a useful set of techniques to add to the armoury!